"Easy game day appetizer that you can prepare in advance. Guests will just reach in and pull out a chunk of bread. You'll need lots of napkins!" Preheat an oven to 375 degrees F (190 degrees C). Cover a baking sheet with a layer of aluminum foil. Without cutting through the bottom of the bread, deeply score the bread into 1 inch squares. Place the bread on the prepared baking sheet. Tuck the sliced Swiss cheese into the cuts, making sure to get into each score mark. Evenly sprinkle the green onions over the cheese, tucking some down into the cuts. Stir together the melted butter, poppy seeds, and celery salt. 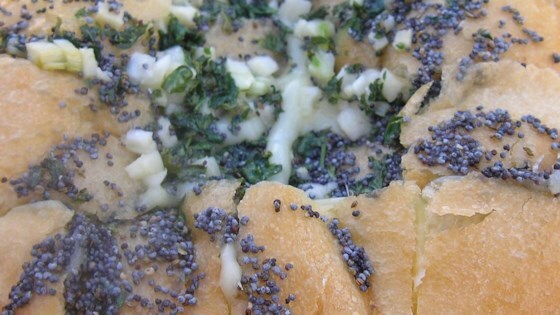 Spoon the butter mixture evenly over the stuffed bread. Cover the loaf with another sheet of aluminum foil. Bake in the preheated oven until the cheese is melted and the bread is hot, about 1 hour. Keep cheese cheesy, don't overcook.